When people used to tell me they made their own granola, in my head they were instantly elevated to the dizzy heights of domestic goddess – I mean who has the time to bake their own granola, and also how the hell do you make it? Well things sure have changed since then and I’ll tell you something – you can knock up a huge batch of granola that will last you all week in less than half an hour. And it’s really easy. And you’ll look like a regular Bree Van der Camp to all your friends and fam. Winning. 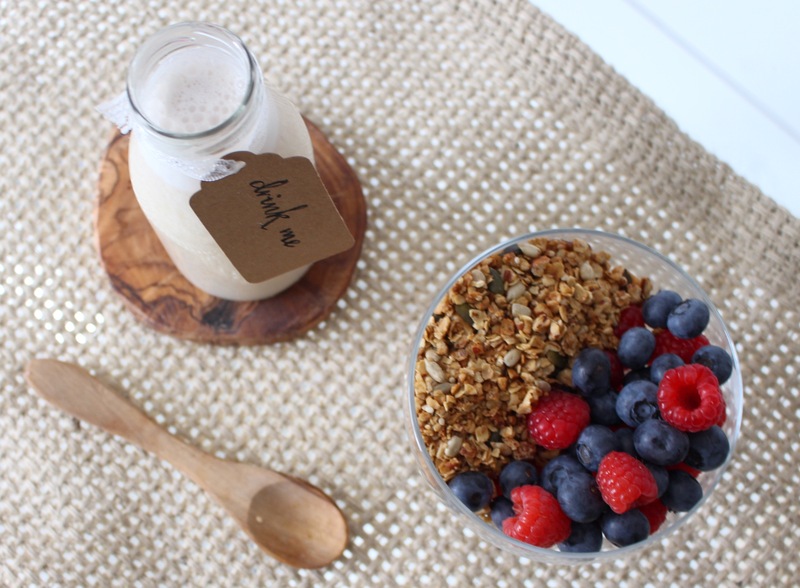 There are heaps of lovely (and healthy) granola products available these days, but they can be a little bit pricey. This granola shouldn’t cost you more than a couple of pounds per batch, and you can use it as a base and play around with the flavours to mix it up a bit (see below for some optional ingredient ideas). I tend to make a big batch of this on the weekend so that I have enough to last the whole week – it’s such a great breakfast as the oats are really filling and full of slow release energy and the nuts and seeds provide protein and good fats and give it the loveliest crunch. What’s also good is that with the maple syrup a little really does go a long way, so you only need a few tablespoons to give it the perfect amount of sweetness. 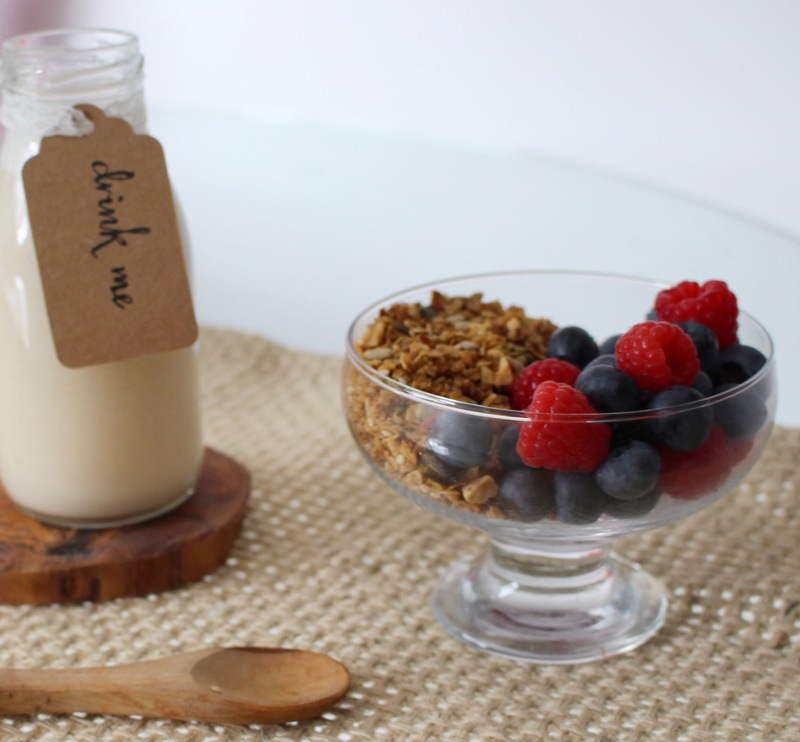 I love this with homemade almond milk, coconut yogurt or fresh berries – it’s also in our delicious parfait recipe, which I’ll be sharing with you very soon! Pop the maple syrup and coconut oil together in a saucepan, place on a low heat and stir until they are totally melted. Then blitz the nuts in a food processor for 20 seconds or so until they are all roughly chopped. Add all the ingredients into a mixing bowl (NB if you are using dried fruit or chocolate chips, simply stir them in at the end as they may burn otherwise) and once all mixed together spoon the granola onto a lined baking tray. Bake at 180 degrees for about 25 minutes, opening the oven to stir every 5 minutes or so so that it bakes evenly and doesn’t burn. Once it’s all lovely and golden, add in any extra ingredients and store in an airtight container at room temperature.